Made from T-304 Stainless steel. 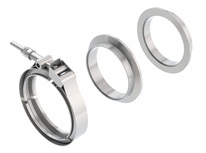 V-Band clamps work well in stressful, vibration, and extreme temperature conditions. Allow for a gasket free seal, and quick disassembly. Feature a male / female design to ensure proper alignment of flanges inside of clamp. Natural Mill finish. Can be brushed or polished prior to installation. Contains 1 male flange, 1 female flange, 1 clamp. These are made in the Whs. Do not need to make packets for MFG.